The Whitehouse holiday development is divided into two apartments and four cabins, all accommodation has stunning sea views from all aspects. The apartments accommodate 8 people with ease. For larger parties, due to its considered design, the house can be booked as one property. The apartments are available now for booking after an extensive reburbishment in March 2010. The beach cabins, which canl accommodate up to four people also have stunning sea views and their own parking and private decking areas. These are available for booking today. Below is more information on the layout of the development and the features of the four cabins and two apartments. Located in the charming hamlet of Flat Cliffs are these stunning holiday properties, refurbished to a good standard. There are four holiday cabins and of course the beautiful art deco White House which encapsulates the 1930s design. Once owned by Sir Billy Butlin himself, it has been a famous landmark for many years. Surrounded by elegant landscaped gardens there couldn’t be a better location for that perfect seaside holiday experience. Spectacular sea views can be enjoyed from the private terraces, balconies and gardens. White House Apartment 2 boasts a wonderful 50m² roof terrace with a fantastic view. 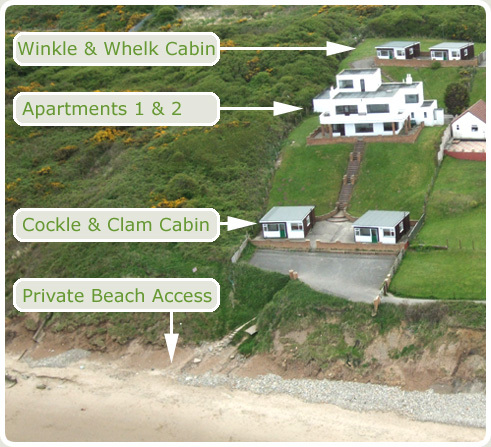 An idyllic location for surfing or kayaking with direct access to the 5 mile stretch of award winning sandy beach. With easy access to the Cleveland Way and the North Yorkshire Moors it’s perfect for the walking enthusiast. Just 2 miles to the north is Filey town, where an abundance of shops, inns, tea rooms and restaurants can be found. Bempton Cliffs, 4 miles, is home to the RSPB Bird Sanctuary where huge colonies of breeding sea birds can be seen on the 400ft high cliffs. Historic homes, halls and castles abound in this area; there’s Burton Agnes Hall known for its collection of Renoir and Monet art, Castle Howard, film set of ’Brideshead Revisited’, Sewerby Hall and Gardens all within easy driving distance. Golf, horse riding, fishing trips, cinemas, theatres, art galleries and museums are all available making this stunning holiday location the perfect place to begin and end your day. In addition to the two apartments in the main house, there are also four identical self contained holiday cabins that can sleep up to four people each. All cabins are single-storey properties converted to a very high specification. Each cabin has electric heating, panoramic sea views, private parking and private beach access. They are all individually named as 'Cockle', 'Clam', 'Winkle' and 'Whelk'.